Since it's Autumn in the northern hemisphere and apples are all around, and also because we were given 20kg of apples for Chuseok, I suddenly craved apple pie, the authentic, very simple one. No, I didn't need all those apples for that, we kept only a few and gave away the rest. 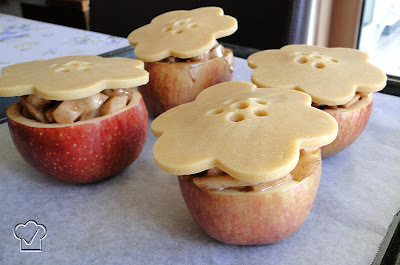 To make the authentic different, instead of lining a pan with pie dough, then filling with apples and then covering with more dough, I used the apple as an edible container. The result was quite interesting, I think. The inspiration came from Paper Plates and China. I started with the pie dough (the recipe can be found by clicking the recipe link at the end of the post). I rolled the dough between two plastic sheets using chopsticks as guides for an even thickness. I put the sheet of dough on a cutting board and placed it in the fridge while working with the apples. I washed a few apples and cut off a lid from each one. With the help of a small sharp knife and a small spoon I caved the apples forming bowls and set the chopped pulp aside. To avoid the apples from getting dark, I added a few drops of lemon juice. Mix the ingredients and sprinkle over the reserved apple pulp. Toss with a spoon and fill the apple bowls. 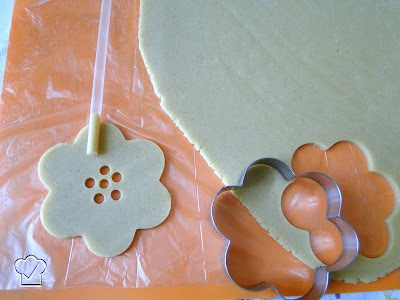 Remove the dough from the fridge and cut flowers with a cookie cutter. make some holes to release vapor while baking. Bake at 370°F (190°C) in a baking pan lined with parchment paper until they are tender and the dough is lightly golden (about 40 minutes). Serve warm or cool, lightly sprinkled with powdered sugar. Put all ingredients in the jar of a food processor and mix only until it forms a ball. If necessary, add a few drops of cold water. Don't over mix. If you want do do it manually, mix the dry ingredients in a bowl. Add the butter and rub the mixture with your hands until you have a crumbled texture. Add the egg and mix until it comes together into a ball. If necessary, add a few drops of water. Do not over mix. Obs: This dough recipe is enough to make lids for approximately 8 apples. ***Due to the difficulty with the Korean language, I'm not quite sure about the type of apple I used, there aren't many varieties here. However, the type that mostly resembles the one I used and that kept its shape pretty well after baking is the Fuji Apple. I used THIS CHART to come to this conclusion. 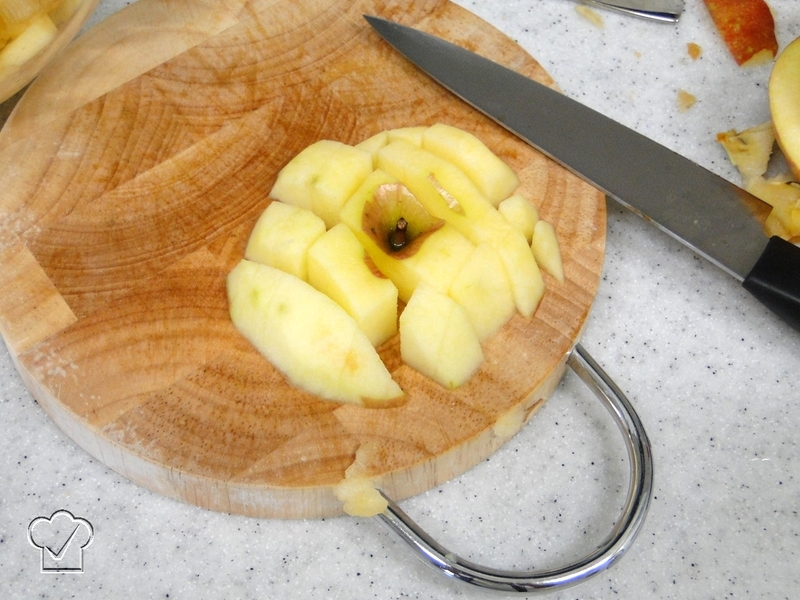 At the end of the page you will also find a chart with the best types of apples for each use. Renata! 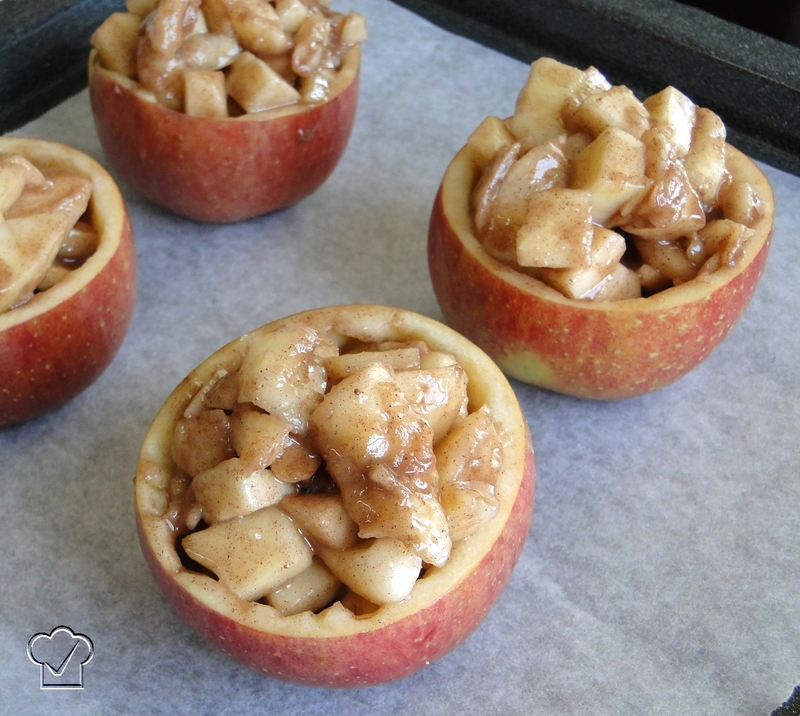 I have been looking for the ultimate apple dessert to welcome in Fall, for a week now, and I wish I had thought of this! I was thinking of stuffed apples wrapped in phyllo ot puff pastry, but never thought of using the insides of the hollowed out apple to make an apple pie filling for it! It's like an apple pot pie!, That top crust is gorgeous!! I love this..I may need to borrow it from you, (with full credit, of course!! I wish my RSS reader worked so I don't miss something like this again! OMG Renata this recipe is amazing!!! Beautiful! These are beautiful! I love what you did! Your pie crust topping is perfect. I think I like it better than mine! Thanks for extending the credit. This is insanely creative. Absolute genius!! 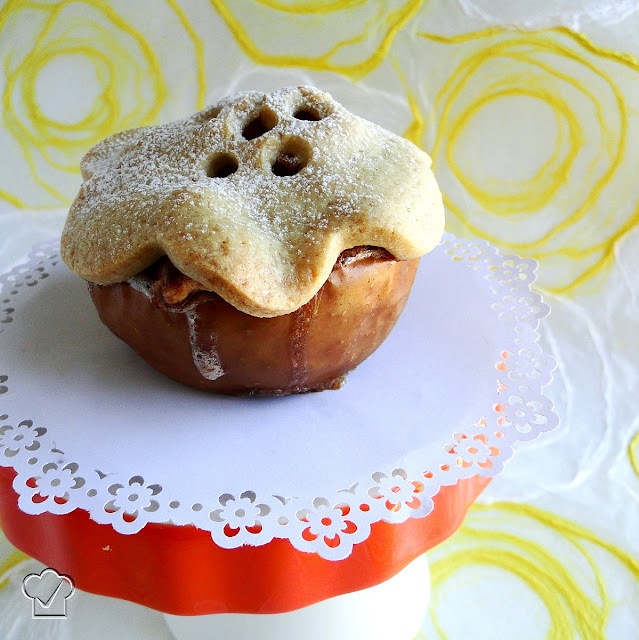 They are very clever and the cutest little pies! Renata, What a great post! Beautiful pictures (love the shaped plate that echoes the shape of the crust on top of the apple) and so many good ideas. Looks like your apple filling is full of cinnamon too. Perfect! Renata, this apple pie is one of best thing I have seen. Love it. You are awesome. I won't reach any where near to this creations. Those look amazing! What an unusual way of preparing apples. wow this is so ridiculously cute! Awesome idea Renata! 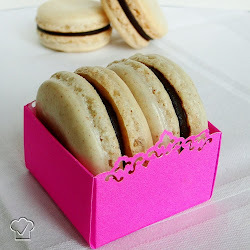 Next time I invite friends over I'll make these, they are so cute! Renata, those are the cutest things ever! What a clever idea. Thanks for sharing. How long did you bake them for? Where the apples inside completely tender? Hi Renata! This recipe looks amazing, and certainly hits my North American "Fall" tastebuds! Where are you? We're in Brasilia! Just found this on Pinterest and I love it. I am now following you and can't wait to go through all your great recipes. I would love it if you followed me back. so cute! I want some right now! These are sensational Renata...ever so CUTE! So glad it's Fall and the more yummy apple recipes, the yummier life will be! OMG, this is wonderful! Thanks for sharing this tasty idea, I'll surprise my guests with these pies. I love this idea, and I want to try it for our next family gathering. The recipe says to bake until the apples are tender, but about how long should that be? @Anonymous - Glad you liked it! I baked it for about 40 minutes. I'll add this info to the recipe. For those asking how long to bake this you will find that answer, 40 minutes or so, at the end of the recipe in ( ). Looks like a great recipe and I can't wait to try it!! I just posted a comment but gave you the wrong blog address - the highlight is here: craftingharmony(ddott)com/2011/11/07/tasty-tuesday-2/ Thanks again for this delicious recipe! I have never seen anything more creative. For the first time I actually am going to try to make this... tomorrow. Thank you so much, not only for thinking it up, but for sharing with all of us. I can't wait to try it! There is no sugar in the sweet pie dough? Is that correct? I'm sorry, that was a typo, but I have already added the missing information. Thanks for advising! I absolutely LOVE this idea! I lilnked to your post on my blog this week. Thanks so much for sharing! I baked these today and they turned out woderful! :) My family loved them and the cooking time of 40 mins was just right! Definetly worth the effort! I was wondering about the cornstarch-1/2cup? Seems like a lot of cornstarch? @Annonimous - The amount of corn starch is correct, but you may want to use 1 cup cake flour instead of 1/2 cup a.p. flour + 1/2 cup corn starch. And, of course, different flour brands have different humidity content, therefore, if your dough turns out too soft, add bits of flour and if it turns out too crumbly and dry, add a few drops of cold water. Hello! this recipe sounds amazing! I was wondering what kind of apples you used, since I know that not all types would hold up that well to 40 minutes in the oven! Thank you! I followed this recipe exactly and it was deee-licious! It looked great too, with a minor variation for the lack of a flower cutter. Thank you for a truly inspired dessert! Saw this on Pinterest.com...AlL I can say is WOW, I'm doing this tonight! I just made these, it was so easy! Thanks so much for the step by step tutorial as they made for easy instructions! 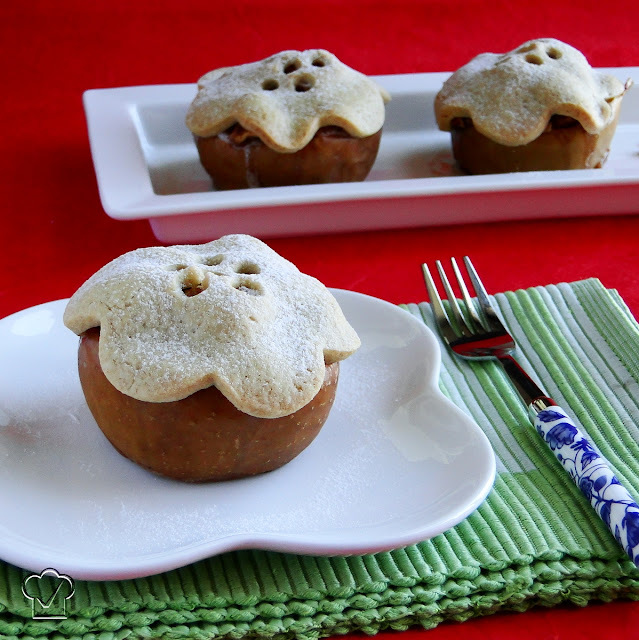 These are perfect for family dinners, because everyone can have their own litte pie! And then the top crust can be in any shape for any occasion! (I am using hearts currently). hi renata! 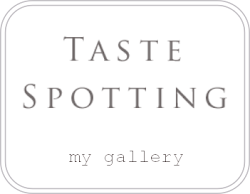 just came across one of these beautiful pictures on fancy and recognized your logo, so i thought i'd drop in and say hi! this pie in a fruit concept is blowing my mind! will try it next fall for sure! Thanks Renata! I just had it and maybe it didn't look that good but it tasted delicious! :) you made my Sunday evening! Thank you for sharing this creative idea, I will certainly try it real soon. Wow...I absolutely love this concept! I so need to veganise this and if i do i'll be sure to blog it and link back to you! 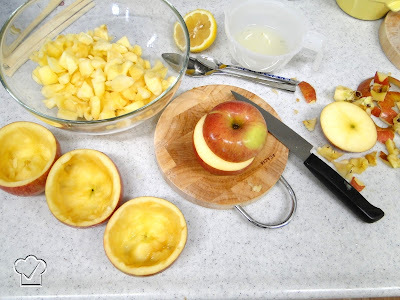 For those who are having trouble scooping out the bottom of the apples - I was wondering if a grapefruit spoon (or grapefruit knife) might help - after running the small sharp knife around the sides. This is so pretty! Can hardly wait to try it! Afinal das contas...quem é você ou vocês??? Eu estava procurando uma receita de pavê de maracuja e me deparei com estes pratos lindo,magnifico! Tudo aqui está lindo d +,parece tb delicioso,requer muita paciência,delicadeza e arte p\tanto. Olá Luci, obrigada pelo carinho :) Eu sou Renata, muito prazer! Não, não cozinho profissionalmente. 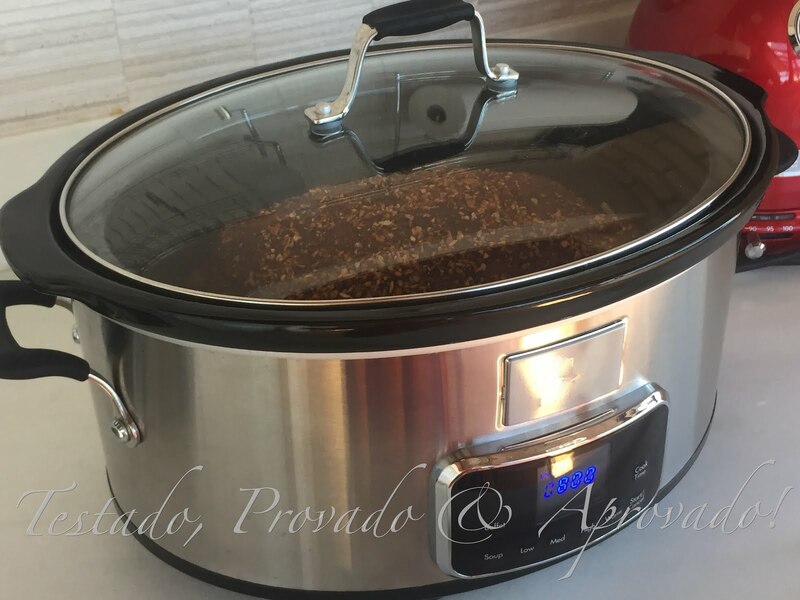 Este é meu hobby, faço com muito prazer e compartilhar minhas receitas e idéias é uma coisa muito gratificante para mim. I never tried an apple pie by myself before. But seeing how creative you are and the preparation you made it was so perfect and I'll try making it myself. This apple pie is awesome. Very creative and looks so delicious! I would say a scant half cup of butter. Hello! I was just wondering, can I use a store bought shortcrust pastry without blindbaking and still have it turn out golden? Thanks. No blind baking is necessary here. In my country, we don't have this kind of store bought pastry, so I can't tell the result, but I would guess it will turn out good. 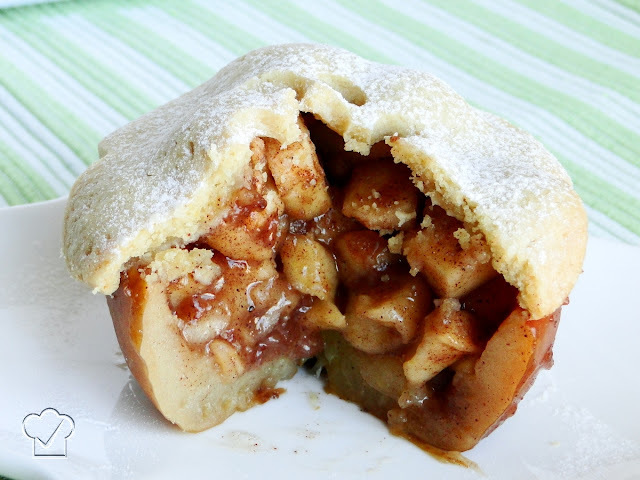 Renata, this is such a lovely presentation -- sort of apple pie / apple dumpling all rolled into one! 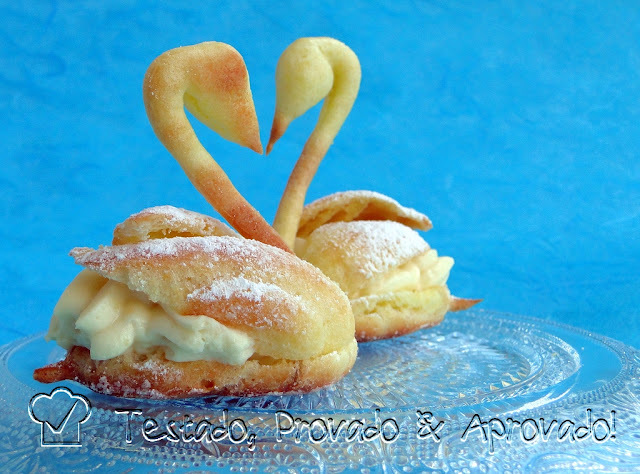 Divinas de aspecto y de sabor, te invito a ver mi version, gracias por compartirlas, un saludo. Devido ao grande número de mensagens de "spam", Testado, Provado & Aprovado não aceita mais comentários anônimos. Desculpem o transtorno. Due to the large number of spam messages, Testado, Provado & Aprovado no longer accepts anonymous comments. Sorry for the inconvenience. Aprenda a cultivar seu próprio fermento natural! Não perca nenhum post! Don't miss a post! BOLO PETELECO - Quem lembra? Obrigada pela Visita! - Thanks for stopping by! © Testado, Provado & Aprovado! All rights reserved. Powered by Blogger.